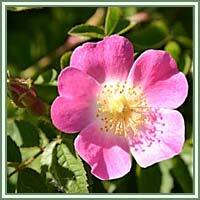 Habitat: Dog Rose is native to Europe, northwest Africa and western Asia. The plant prefers moist or wet soil. Description: Dog rose is a deciduous shrub usually growing from 1 to 5 meters in height. Its numerous stems are covered with sharp hooked spines and prickles, which can aid the plant climbing other plants. Leaves are odd-pinnate, with 5 to 7 leaflets, with serrated margins and soft hairs on the underside. Flowers are pale pink or pale red, but can easily be deep pink or even white. They are five-petaled, and appear from May to June. Flowers are followed by an oval, red-orange fruit, or hip. Parts used: Fruit, petals, hips, gals. Medicinal use: Dog Rose is considered to be an astringent, carminative, diuretic, laxative, opthalmic and tonic. 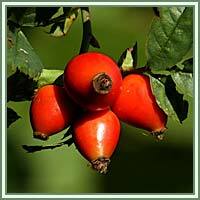 Hips of Dog Rose are used in cases of colds, influenza, different infections scurvy, diarrhea, gastritis, coughs. The fruit is recognized for its high vitamin C levels, being up to 50 times higher than the level found in Orange. Distilled water made from the plant has been used as a skin lotion, and the seeds have been used as a vermifuge. Some studies suggest that the hips of the Dog Rose could be able to prevent or stop the development of cancer cells. Safety: Consumption of the hair-like layer of the Dog Rose fruit could cause irritation in the mouth and severe disturbances of the digestive system. Always consult your doctor/herbalist before consumption of any herb.